When it comes to collecting vintage vehicles, some folks may confuse collectability with rarity. A bike can be very sought-after without being rare. BSA Airborne bicycles are not rare. With the exception of the Raleigh Superbe, they come up for sale more frequently than any other model of vintage bicycle of the period. This is because at least 70,000 were manufactured, and their ‘quirkiness’ and practicality means that postwar owners were less likely to scrap them. Nevertheless, they are very sought-after, as they are admired by different groups of enthusiasts: military collectors, vintage bicycle enthusiasts, investors, BSA collectors, and collectors who fancy a practical old machine that will fold up into the boot of their car. 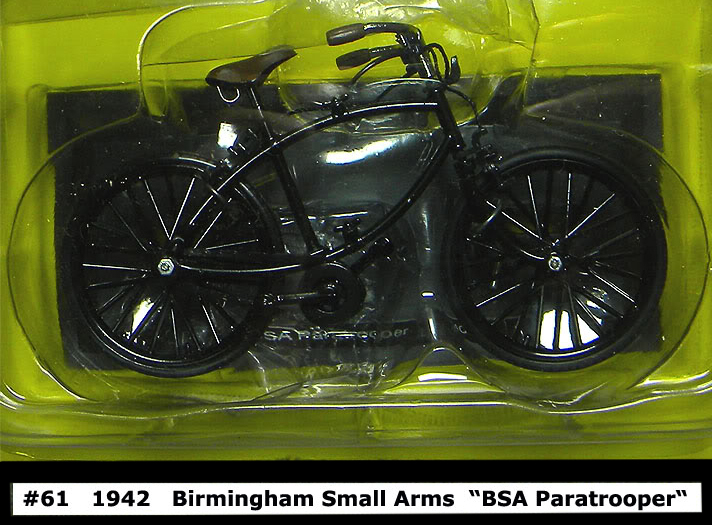 It’s ironic that this Del Prado model of the BSA Airborne, made quite recently, is much harder to find than the real thing. Though, in mitigation, it is very much cheaper. This one was advertised on San Francisco craigslist. A fellow cycle enthusiast mentioned on an internet forum that the seller had a large collection of Del Prado bicycle models for sale. I dashed off an email to the seller and received a reply almost immediately, inviting me to call round to collect it. When I phoned the seller, he was shocked when I pointed out that I was too far away to call on him personally. Luckily, email, paypal and postal services make buying easy in the 21st century, and this item is now on its way to me. I’ll add more photos when it arrives.